The second part of the Pillars of Eternity documentary "Road to Eternity" is now online, and predictably, this chapter is considerably more upbeat than part one. That's not to suggest that the runaway success of the Kickstarter campaign was entirely without aggravation: As the saying goes, mo' money, mo' problems. The studio had high hopes for the Kickstarter, but wasn't prepared for how quickly things would happen. Executive Producer Adam Brennecke says in the video that many people at the studio didn't think it would pull in more than $100,000 on the first day, a span that ultimately ended with roughly $1.1 million. "It was probably the best day in Obsidian's history," he said. But it also left the developers in the position of having to extend their plans for the game much more quickly than anyone had expected. "All of us were in a lot of ways scrambling," CEO Feargus Urquhart explains. "And hopefully what it looked like from the outside is that we had our crap together. On the inside, it didn't always feel that way." It's inspirational stuff, and I dearly hope the game lives up to it. 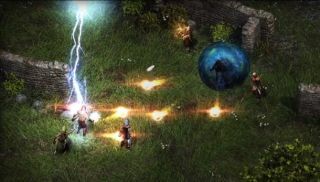 We'll find out soon enough: Pillars of Eternity is out on March 26, just three days from today.